Sustained research can lead you to unexpected places. For Yuko Mohri, her interest in that which is usually ignored has lead her to 8 years of exploring water leaks in the Tokyo metro. In 2015 the installation piece Moré Moré [Leaky]: The Falling Water Given #1-3, won Mohri the Grand Prix at the Nissan Art Award. This was followed by residencies at both the V&A and Camden Art Centre in 2016. 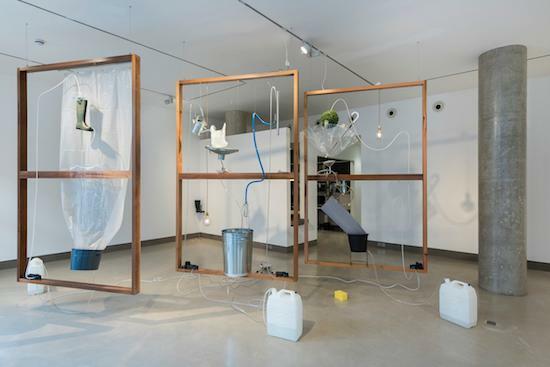 And as part of her first UK solo show at White Rainbow, Mohri has authored versions #4-6 of The Falling Water Given, creating this new installation from scratch over 10 days. The large-scale (272.5 x 175.8 x 50cm each) three frame installation hangs from the ceiling and dominates the gallery space. It contains three separate circuits, three individual kinetic water sculptures, and three free-form systems. The frames that support the circuits formally resemble Duchamp’s The Bride Stripped Bare by her Bachelors, Even (The Large Glass), and the artist’s ideas are of significant inspiration. 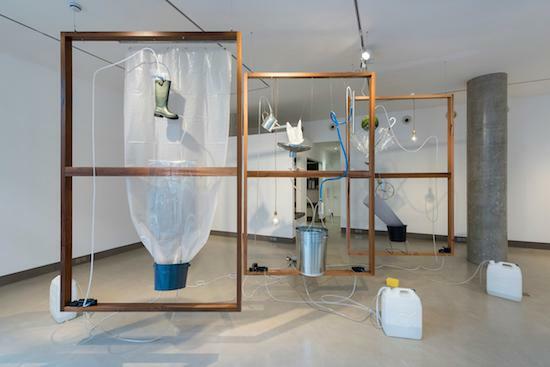 The tubes, watering can, umbrella, shower curtain, plastic plant, buckets, plastic sheets, funnels and lightbulbs that build up the installation are everyday objects collected by Mohri – objects she puts to use when the time is right. The Falling Water Given is a product of her Moré Moré Tokyo (2009 - ) project, where Mohri documents the incredibly inventive DIY water-leak fixes in different metro stations. 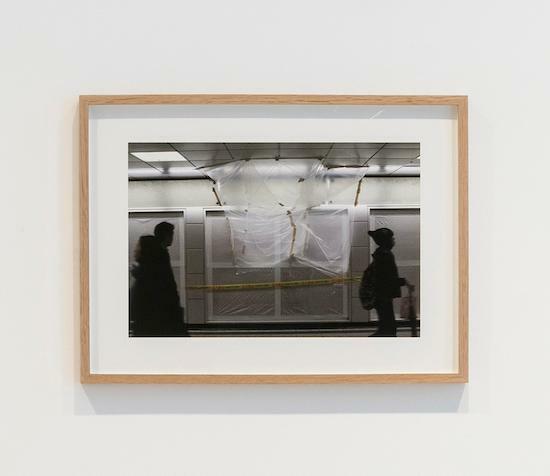 Her photos of some of these accidental installations accompany the installation in the exhibition, showing work from the Shinjuku and Asakusa Stations. In London, experiences with water leaks in the tube brings to my mind discoloured walls, sandbags and obstacles. But in Tokyo these hacks are fascinating rather than bothersome; the inventiveness of the creators/fixers speaks of creative human engagement with a problem, especially following the devastating earthquake and tsunami of 2011, when far more water leaks occurred in stations. Mohri’s photos ground the installation, adding a frame of reference to the abstracted circuits on display. The creative solutions of the station masters are restrained by the equipment and space available to them, and Mohri reflects these issues and limitations in her installation. But Mohri instigates the leak, and challenges herself to fix it. She is restrained by the self-imposed frames, and the items she finds by chance. The work is only complete when the leak is stopped, and the water recirculated to create a functioning hydrosystem. Sound has featured substantially in Mohri’s previous installations, from her 2005 vexations: c.i.p (composition in progress) to the 2014 work I/O Chamber of a Musical Composer. The combination of the flowing water and motors in The Falling Water continue this interest. Just as in her previous pieces, the sound here is not consequential, it is an integral part of the artwork. 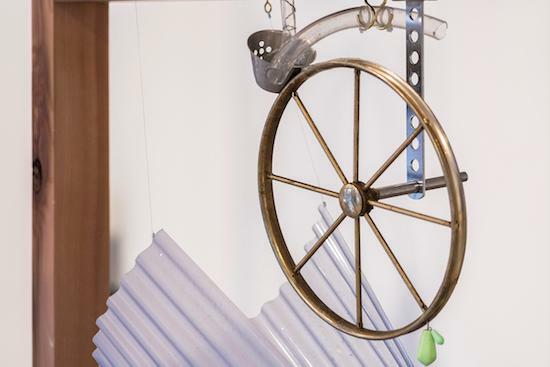 The installation does not hide the cables, pipes and motors that create the kinetic sculpture, and the sounds they make are inherent part of the systems, as sound is too most systems. Here however it also creates an enthralling rhythm with which to read the work. You ears lead your eyes to find and match the senses. In Falling Water #5 a chime with a metal coffee scoop hang side by side. The objects are connected to the water pipes and so flow with the motorised pumps, occasionally chiming, frequently not. John Cage is a significant influence, and his call to “let sounds be themselves” seems appropriate here. The sound is improvised, through circumstance and coincidence, just as the water leak fixes are improvised, but they are not hidden. In a corner, a dark green wellington boot is elevated above the floor. From its base a rubber tube protrudes, rotating before landing on the floor facing upwards. Water is inside the tube, trapped by gravity, unable to move. It is removed from the circuits that surround it, removed from a purpose, and left as it is. Just as the mop head resting on the floor on the other side of Falling Water is waiting for a use and a purpose, the boot is in limbo. Mohri states that her interest in art is in the intersection between the ‘natural’ and ‘unnatural’. The water that is finding its way into the underground stations is breaking through the ‘unnatural’ manmade structures to remind you of its ‘natural’ presence. Mohri’s motorisation of this process emphasises this modern, mutually dependent ecosystem. The randomly collected and selected items that make up each iteration of Falling Water reflect the exchanges between these powers, just as the station staff in the Tokyo Metro are not sure when they will next be called upon to think creatively. Graeme Sullivan talks about research in artistic practice as a ‘creative and critical process that accepts that knowledge and understanding continually change, methods are flexible, and outcomes are often unanticipated, yet possibilities open up for revealing what we don’t know as a means to challenge what we do know.’ Mohri’s engagement with the water leaks at the Tokyo metro have lead her to create a work of intrigue that highlights the unpredictable interplay between human control, nature’s boundlessness and the sometime domesticity of creativity. And it is so refreshing and satisfying to see an abstract installation so obviously inspired by something so publically shared.